Good morning! 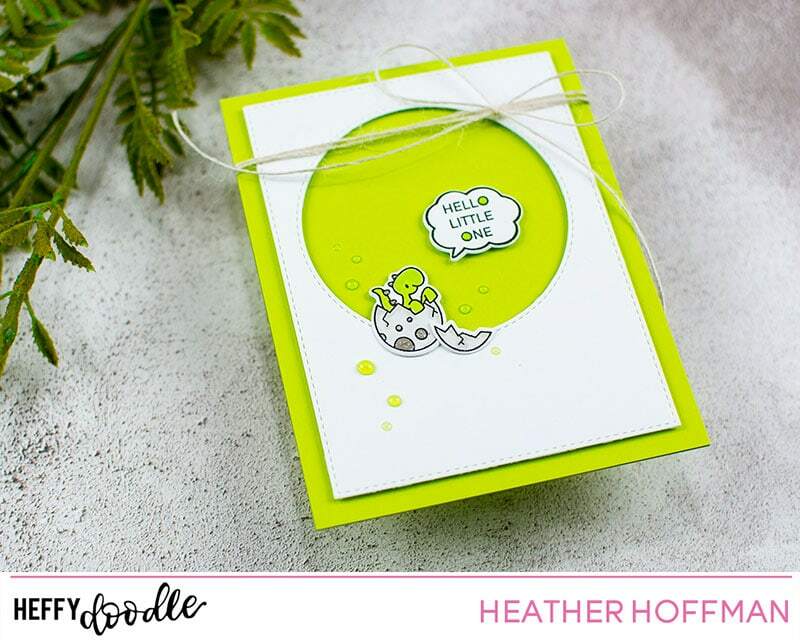 This is Heather – and today I have a simple little baby card to share with you – I love the darling little dino in Dinky Dinos – the cute little free stamp set from the last release! It paired up perfectly with some of the new basic dies and a sentiment from Whatcha Saying Now! I had the worst time getting the color to show up right in these photos – I think it looks more yellow than it really is in real life. It is actually a nice bright green! I used Stitched Circles Dies and Imperial Stitched Rectangles to create the framed window on the front of my card to go over that lovely green cardbase. Next, I stamped and colored that dino and his egg – cutting it out with the coordinating dies. I did the same with the sentiment bubble from Whatcha Saying Now – coloring in the two “o’s” just for fun as well and a pop of color, and cutting out with the coordinating Whatcha Saying Now Dies. I added a few dots of Nuvo Jewel drops in Key Lime around the dino and on the “o’s” on the sentiment, and then used some Grey Mist ones for the dots on the shells and the back of the dino. I finished off with some ivory twine tied around the top of the card! Nice and clean and simple to welcome some cute little guy into the world! How do you get the cute stamp. Your blog says it was free ? Hi Cindy, This Dinky Dino set was free with preorders of our latest release. He will be added to the catalogue and available to buy when we have our next release in early 2019.